Senior Israeli official says US has not informed Israel if president will retain or tear up controversial 2015 Iran nuclear deal. With a May 12th deadline for a decision on whether the US will maintain or withdraw from the 2015 Joint Comprehensive Plan of Action just days away, Israeli officials have heard nothing from Washington regarding President Trump’s plans for the controversial deal. 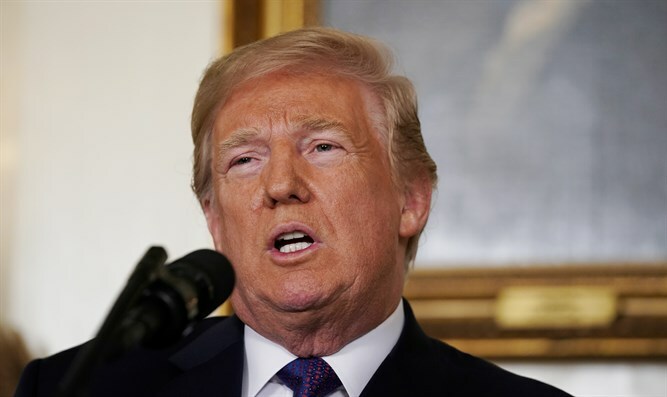 After vowing to “fix or nix” the Iran nuclear agreement, President Trump set May 12th as the deadline for a decision on whether to extend sanctions relief for Tehran – or reimpose sanctions on the rogue regime, effectively terminating the nuclear deal. European allies like France, Germany, and the UK say the JCPOA is flawed but still the best hope at avoiding war with the Islamic republic and preventing it from achieving nuclear weapons capabilities in the next few years. But critics of the bill including Israel, the Saudi Kingdom and Gulf Arab states, as well as many congressional Republicans have warned that the deal ignores large swathes of Iran’s nuclear weapons program, including the development of delivery systems, and pointed out that the deal would only delay, not prevent Iran from achieving nuclear weapons. President Trump has in the past lambasted the deal, calling it one of the ‘worst in history’. Yet the White House has not indicated whether President Trump will reimpose sanctions on May 12th, keeping even close allies in the dark. A senior Israeli official said the Trump administration has not informed Israel of its plans vis-à-vis the deal and the Saturday deadline, AFP reported Sunday. "In effect, I don't know what Trump will decide because he hasn't told me," the senior Israeli official. "I think that he has the same skeptical view,” the official added. Trump has a number of options available, the official clarified, and could still seek to fix the JCPOA even while refraining from extending the sanctions relief. The president could, the official said, allow the sanctions relief to lapse, but use the interim period before the sanctions are restored to pressure European allies to join his bid to renegotiate key elements of the deal and secure an addendum beefing up restrictions on Iran’s nuclear weapons program. Alternatively, the president could restore sanctions selectively to parts of Iran’s economy to pressure Tehran to return to the negotiating table. "I think you want to ratchet up the pressure," the Israeli official said. "If you don't violate a dangerous deal, it doesn't make it less dangerous,"